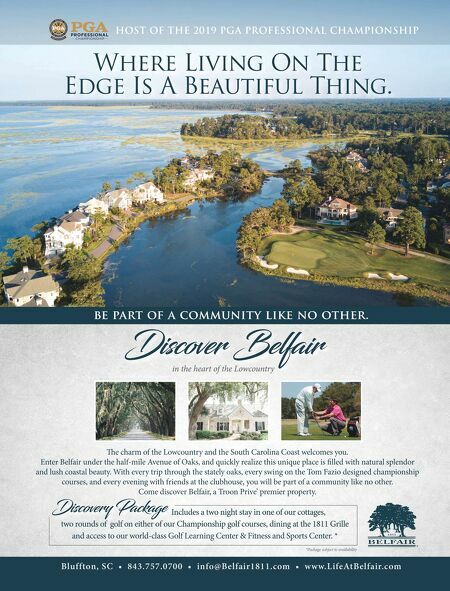 W elcome to the fifth issue of our new Carolinas Golf Magazine! By the time you receive this letter, the weather should be warming, your equipment ready, bodies in perfect mental and physical shape; and, last but not least, all the new rules learned and understood. All you need now are com- petitive opportunities! Upon its creation in 1909, the CGA's original intent was to conduct tournaments which would identify the Carolinas' best play- ers by administering championship golf. Six years later in 1915, executive board member, Pop Rivers, enhanced the CGA mission by adding the commitment to growing the game. Rivers stated, on the record, "Never mind the first flight men, you can't lose them. For they are fully inoculated." 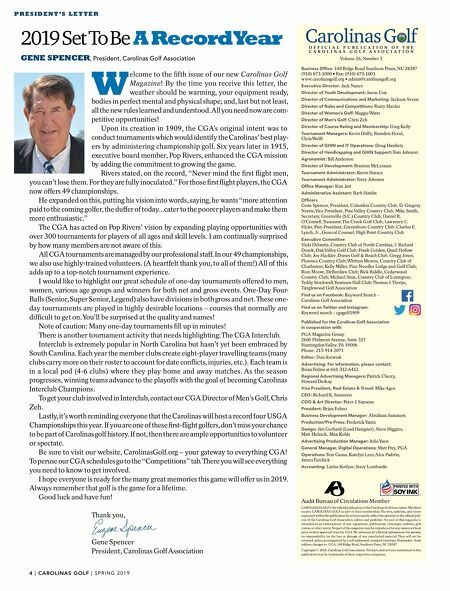 For those first flight players, the CGA now offers 49 championships. He expanded on this, putting his vision into words, saying, he wants "more attention paid to the coming golfer, the duffer of today...cater to the poorer players and make them more enthusiastic." The CGA has acted on Pop Rivers' vision by expanding playing opportunities with over 300 tournaments for players of all ages and skill levels. I am continually surprised by how many members are not aware of this. All CGA tournaments are managed by our professional staff. In our 49 championships, we also use highly-trained volunteers. (A heartfelt thank you, to all of them!) All of this adds up to a top-notch tournament experience. I would like to highlight our great schedule of one-day tournaments offered to men, women, various age groups and winners for both net and gross events. One-Day Four- Balls (Senior, Super Senior, Legend) also have divisions in both gross and net. These one- day tournaments are played in highly desirable locations – courses that normally are difficult to get on. You'll be surprised at the quality and names! Note of caution: Many one-day tournaments fill up in minutes! There is another tournament activity that needs highlighting: The CGA Interclub. Interclub is extremely popular in North Carolina but hasn't yet been embraced by South Carolina. Each year the member clubs create eight-player travelling teams (many clubs carry more on their roster to account for date conflicts, injuries, etc.). Each team is in a local pod (4-6 clubs) where they play home and away matches. As the season progresses, winning teams advance to the playoffs with the goal of becoming Carolinas Interclub Champions. To get your club involved in Interclub, contact our CGA Director of Men's Golf, Chris Zeh. Lastly, it's worth reminding everyone that the Carolinas will host a record four USGA Championships this year. If you are one of these first-flight golfers, don't miss your chance to be part of Carolinas golf history. If not, then there are ample opportunities to volunteer or spectate. Be sure to visit our website, CarolinasGolf.org – your gateway to everything CGA! To peruse our CGA schedules go to the "Competitions" tab. There you will see everything you need to know to get involved. I hope everyone is ready for the many great memories this game will offer us in 2019. Always remember that golf is the game for a lifetime. Good luck and have fun! Thank you, Gene Spencer President, Carolinas Golf Association 4 | | S P R I N G 2 0 1 9 P R E S I D E N T ' S L E T T E R 2019 Set To Be A Record Year GENE SPENCER , President, Carolinas Golf Association Carolinas G lf O F F I C I A L P U B L I C A T I O N O F T H E C A R O L I N A S G O L F A S S O C I A T I O N Volume 26, Number 1 Business Office: 140 Ridge Road Southern Pines, NC 28387 (910) 673-1000 • Fax: (910) 673-1001 www.carolinasgolf.org • admin@carolinasgolf.org Executive Director: Jack Nance Director of Youth Development: Jason Cox Director of Communications and Marketing: Jackson Sveen Director of Rules and Competitions: Rusty Harder Director of Women's Golf: Maggie Watts Director of Men's Golf: Chris Zeh Director of Course Rating and Membership: Greg Kelly Tournament Managers: Kevin Duffy, Brandon Hood, Chris Wolff Director of GHIN and IT Operations: Doug Hardisty Director of Handicapping and GHIN Support: Tom Johnson Agronomist: Bill Anderson Director of Development: Braxton McLennan Tournament Administrator: Kevin Haracz Tournament Administrator: Torey Johnson Office Manager: Kim Jett Administrative Assistant: Barb Hanlin Officers Gene Spencer, President, Columbia Country Club; D. Gregory Norris, Vice President, Pine Valley Country Club; Mike Smith, Secretary, Greenville (S.C.) Country Club; Daniel R. O'Connell, Treasurer, The Creek Golf Club; Lawrence C. Hicks, Past-President, Greensboro Country Club; Charles E. Lynch, Jr., General Counsel, High Point Country Club Executive Committee Vicki DiSantis, Country Club of North Carolina; J. Richard Dosek, Oak Valley Golf Club; Frank Golden, Quail Hollow Club; Joe Hackler, Dunes Golf & Beach Club; Gregg Jones, Florence Country Club; Whitten Meares, Country Club of Charleston; Kelly Miller, Pine Needles Lodge and Golf Club; Rion Moore, DeBordieu Club; Rick Riddle, Cedarwood Country Club; Michael Sims, Country Club of Lexington; Teddy Stockwell, Yeamans Hall Club; Thomas J. Thorpe, Tanglewood Golf Association Find us on Facebook: Keyword Search – Carolinas Golf Association Find us on Twitter and Instagram: Keyword search – cgagolf1909 Published for the Carolinas Golf Association in cooperation with: PGA Magazine Group 2600 Philmont Avenue, Suite 325 Huntingdon Valley, PA 19006 Phone: 215-914-2071 Editor: Don Jozwiak Advertising: For information, please contact: Brian Folino at 661-312-6412 Regional Advertising Managers: Patrick Cherry, Howard Derkay Vice President, Real Estate & Travel: Mike Agee CEO: Richard K. Summers COO & Art Director: Peter J. Sansone President: Brian Folino Business Development Manager: Abraham Summers Production/Pre-Press: Frederick Yantz Design: Jim Gerhard (Lead Designer), Steve Higgins, Matt Hulnick, Max Kohls Advertising Production Manager: Julie Yuen General Manager, Digital Operations: Matt Frey, PGA Operations: Tom Gauss, Katelyn Leer, Alex Padrón, James Turchick Accounting: Larisa Kotlyar, Stacy Lombardo Audit Bureau of Circulations Member CAROLINAS GOLF is the official publication of the Carolinas Golf Association. Members receive CAROLINAS GOLF as part of their membership. The text, opinions, and views expressed within this publication do not necessarily reflect the opinions or the official poli- cies of the Carolinas Golf Association, editor, and publisher. No part of this magazine is intended as an endorsement of any equipment, publication, videotape, website, golf course, or other entity. No part of this magazine may be reproduced for any reason without prior written approval from the CGA. We welcome all editorial submissions but assume no responsibility for the loss or damage of any unsolicited material. They will not be returned unless accompanied by a self-addressed, stamped envelope. Postmaster: Send address changes to: CGA, 140 Ridge Road, Southern Pines, NC 28387 Copyright © 2018, Carolinas Golf Association. Products and services mentioned in this publication may be trademarks of their respective companies.